"I'm going to shut up now so I can pack in as much music as possible," said tUnE-yArDs front woman Merrill Garbus. She had clearly learned from the festival's previous act, Pusha T, whose 20-minute late arrival meant a truncated set. Garbus wanted to waste no time giving the audience what they wanted. Garbus and company thus performed a tight set that squeezed in as much of the material off of her latest album, Nikki Nack, as possible, as well as some venerable hits. This isn't to say that Garbus' set felt rushed, though; it felt robust, with songs seamlessly transitioning into one another, showing off the new band's harmonious workmanship, which is now rounded out by a talented cast of two back-up singers/dancers, a multi-percussionist and longtime member Nate Brenner. 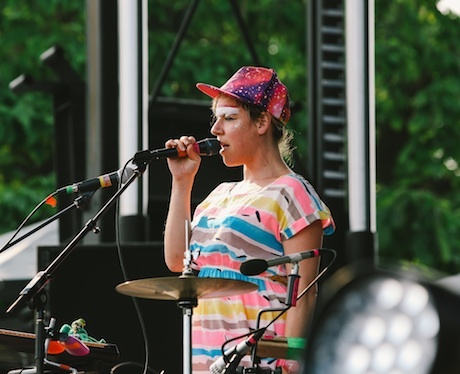 Whereas most bands might find the sun-soaked stages to be an odd change from their usually dimly-lit clubs, tUnE-yArDs' rhythmically-charged set of "weirdo anthems," as an audience member noted, made for one of the day's brightest and most successful sets.